Does anyone know what’s going on? We don’t! It’s all improvised! With more twists, secrets and dirty dealings than parliament! A continuing improvised story that keeps everyone guessing. Including us! Eight nights of shows. Six Characters in search of a storyline. One spontaneous saga of polished stupidity. 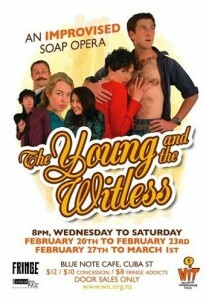 Starring WIT regulars Anna Burns, Anton van Helden, Christine Brooks, Clare Kerrison, Julian Faid, and Simon Smith. Directed by Derek Flores. This entry was posted in past shows, Soap and tagged comedy, improv, improvised, soap opera, witless, Young on February 20, 2008 by MaDmin.